planet manners: USA: Chimpanzees Need Your Help! USA: Chimpanzees Need Your Help! 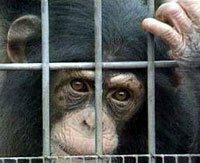 More than 900 chimpanzees are locked in U.S. laboratories, where they have been intentionally infected with diseases such as HIV and hepatitis and forced to endure decades of invasive procedures as well as fear, loneliness, and pain. Please click the link below to urge your congressional representatives to cosponsor and support the Great Ape Protection and Cost Savings Act, which would ban invasive experiments on chimpanzees and other great apes. If the text above does not appear as a link or it wraps across multiple lines, then copy and paste it into the address area of your browser.